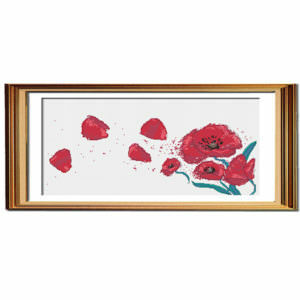 The Poppies in the Wind modern cross stitch pattern is a beautiful stitched illustration commemorating the sacrifices of those who have served their country. 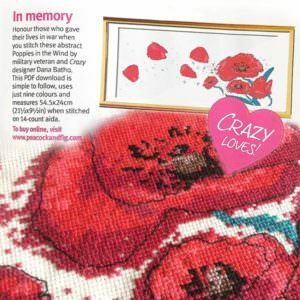 The poppy is an incredibly symbolic flower, and this delicate pattern honours dedicated military men and women, many of whom never came home. This pattern is simple to stitch as there are so few colours, and the back stitch detail of the petals gives the illusion the petals are being blown apart in the wind. 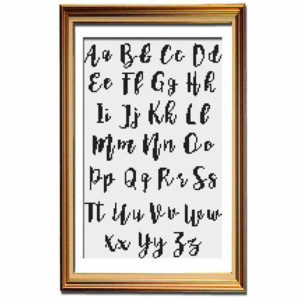 This stunning modern cross stitch pattern will be a beautiful symbolic accent to any decor. This a PDF download, so you can purchase it and get started on your newest project right away. 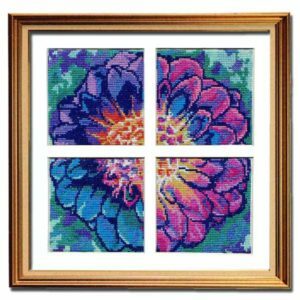 The Solarize Dahlia counted cross stitch pattern set will bring a touch of modern vibrance into any decor with their vivid cool tones. This set consists of four patterns, which can be stitched individually or on one larger piece of fabric to create one image. 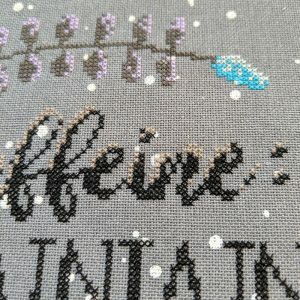 This pattern is full stitches only, with no back stitch. 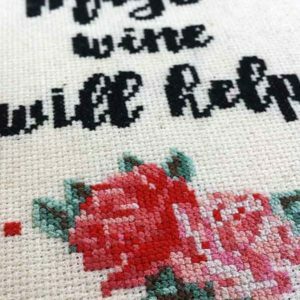 These counted cross stitch patterns are great for beginners as they are small, but also are a fun stitching project for more experienced stitchers. The set is a PDF download, so you can get started on your newest project straight away! 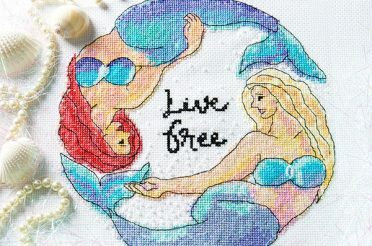 Welcome to the Mermaid Tales cross stitch pattern set! 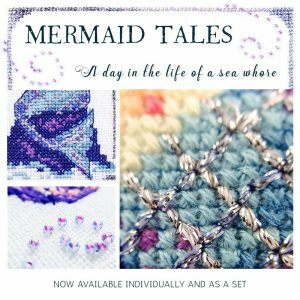 This four-part series started as a stitchalong, and is now available as a standalone set! Featuring four individual patterns (Cold Rock, Telescope, Mirror Mirror, and Mermaid Struggles), this set is perfect for adding a bit of sass and bling to your home. These designs are inspired by an online conversation in which someone was complaining about crocheted mermaid tails for girls, saying “Why on earth would you want your daughter to dress like a fish whore?? ?” Of course much hilarity ensued, and the idea for these patterns was born. 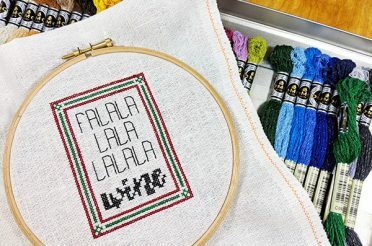 :) The elegant beads and metallic threads contrast with the snarky text on each pattern, making these patterns a unique addition to your stash. PG versions are also included in the Cold Rock and Mirror Mirror patterns. 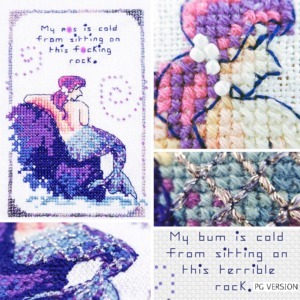 Level up on your sass with these gloriously cheeky mermaid cross stitch patterns. Have you ever had one of those days where you need a gentle reminder to be your best self? 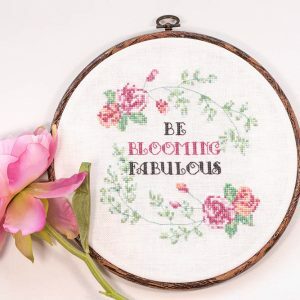 The Be Blooming Fabulous cross stitch pattern just might be that gentle kick up the rear end you need. This punny inspirational quote reminds you to be the best you can be every day, because we can all afford to bring more “fabulous” to our daily life. Gorgeous soft dusty pinks and corals paired with smoky mint greens create a vintage vibe, and will add a touch of softness to any decor. 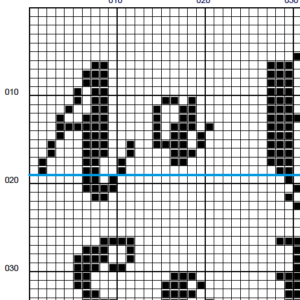 This cross stitch pattern features simple stitches (full stitches, backstitch, and a few fractionals in the letters), so even if you’re a beginner you can feel confident you can accomplish this project. This pattern can also be stitched without the text, giving the arches of roses an old-world feel. 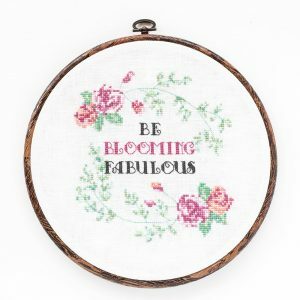 Enjoy stitching the vintage vibe of Be Blooming Fabulous, and remind yourself that you’re awesome. 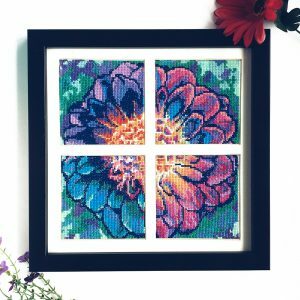 This pattern is also available in the Go Bloom Yourself cross stitch pattern set, and the Go Bloom Yourself collection pattern set (the full collection). Do you ever get so overwhelmed with everything happening in your day, that you just need a reminder to take a breath and remember what’s important? 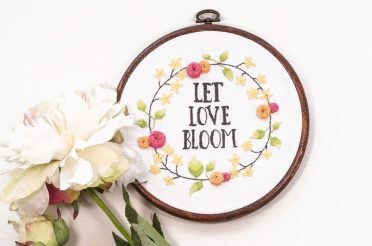 The Let Love Bloom hand embroidery pattern allows you to do just that; reflect on what gives your life meaning — love. This cheerful message encourages positivity, uplifting your home or office decor. It also makes a perfect gift as it is a quote everyone can resonate with. The beautiful delicate colours add a breath of fresh air and vibrancy to your day, they’re so fresh and reviving. 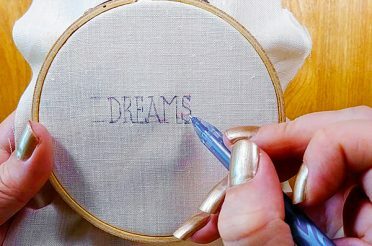 This pattern uses only five hand embroidery stitches, so it is simple enough even for beginners. More experienced embroiderers can experiment with the spacing on the leaf stitch to create texture and variation. 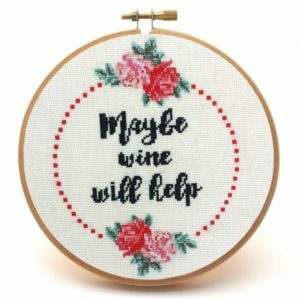 This pattern can even be stitched without the text, leaving a gorgeous delicate wreath, or you can write your own quote to stitch. 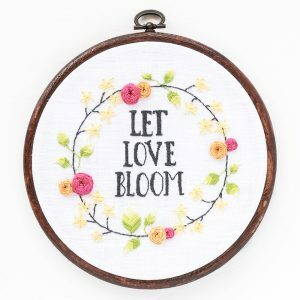 The pretty Let Love Bloom embroidery pattern inspires you to bring out the best in yourself. 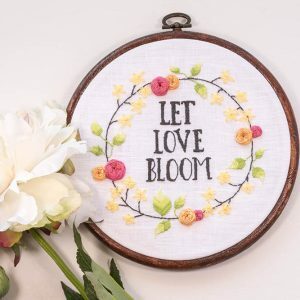 This pattern is also available in the Go Bloom Yourself hand embroidery pattern set, and the Go Bloom Yourself collection pattern set (the full collection). Have you ever wanted to “politely” tell someone what you’re really thinking? 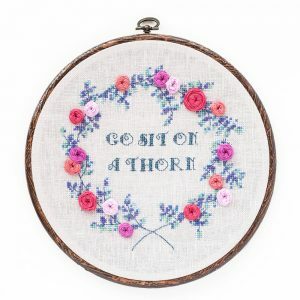 The Sit on a Thorn cross stitch and embroidery pattern might be just what you’re looking for! 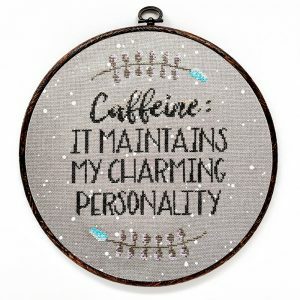 The snarky quote contrasts with the sparkle in the Kreinik thread and elegance of the pattern, and it’s guaranteed to generate a belly laugh from all who see your project. 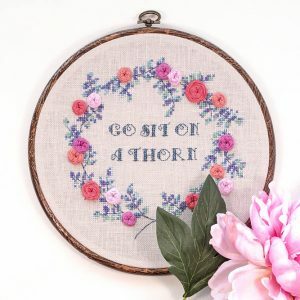 It can be stitched with or without the optional embroidered roses, making it perfect for both cross stitch purists and those wanting to experiment with new stitches. If you do want to stitch the pretty embroidered roses, they add a gorgeous punch of colour and texture that delight the senses. 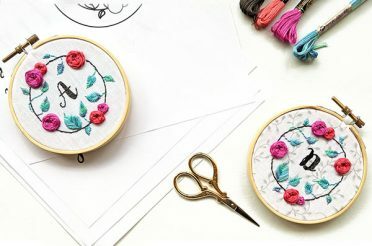 A link to a tutorial for the woven wheel roses is included in the pattern, you’ll be amazed at how simple they are. 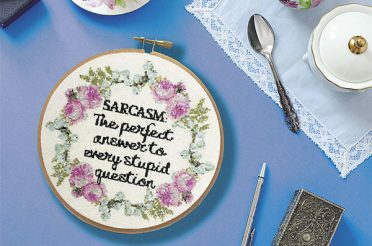 This pattern looks just as beautiful without the text stitched as well, just in case you’re making a gift for someone who doesn’t share your sense of humour. Get your snark on with the Sit on a Thorn pattern. 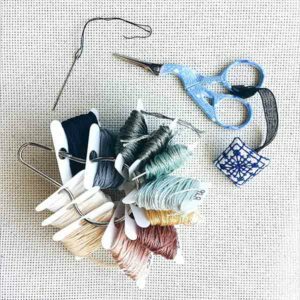 It’s every stitcher’s life — at some point you realize that your stitching stash is so disorganized and expansive that you don’t even know what you have anymore. 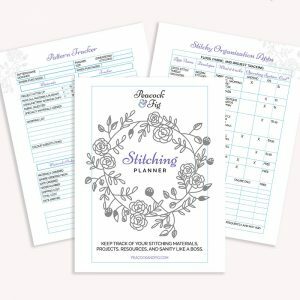 Use this printable PDF stitching planner to track your cross stitch and hand embroidery projects, materials, resources, and save your sanity like a boss. 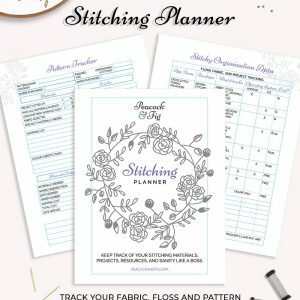 From project tracker pages to floss inventory sheets to resources like legal free patterns and stitchy organization apps, this 40-page stitching planner will restore order to your hobby (and likely help you rediscover a lot of materials and projects you didn’t remember you had). More details of what exactly is included is in the “Planner details” tab below. And if you need even more tracking sheets, the project tracker sheets and floss inventory sheets are also available as an extra add-on. Feel like getting a little stabby? 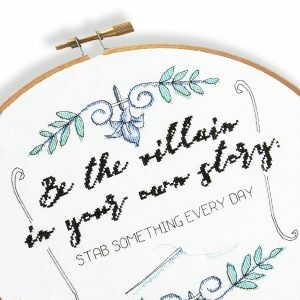 Maybe the “Be The Villain” cross stitch pattern can help you out… 😂 When people ask me what I do, I often say, “I help people relax by stabbing something 20,000 times.” This dark humour reminded me of many villains, and I was inspired by the cool elegance of Bond villains in particular. 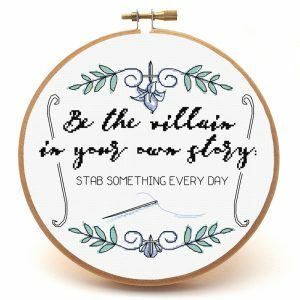 Featured in Issue 5 of XStitch Magazine, “Be the Villain” represents how our outer well-groomed appearance can mask our darker side. This pattern is also available in the full Adulting 101 Collection set. Welcome to Peacock & Fig! 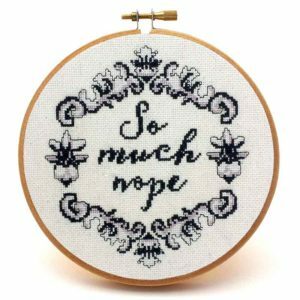 Cross stitch and hand embroidery is the art of stabbing something 20,000 times in order to relax... It sounds incredible to say it like that, but it's so true. 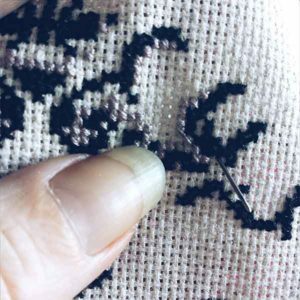 Stitching is a wonderful craft that is really simple to learn and yet can produce such beautiful results. 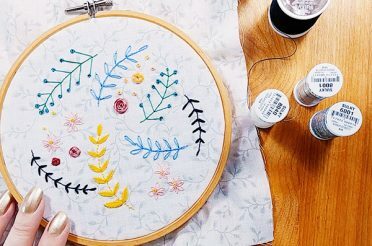 Spending time curled up stitching can be quite meditative, and stitching is a great way to tap into your creativity. 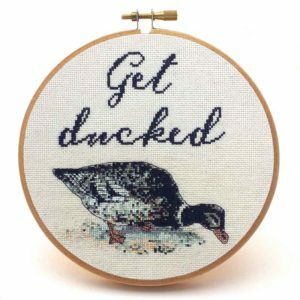 Whether you're a pure novice and have never tried hand embroidery techniques like cross stitch or you're an advanced stitcher, there is something for all levels at Peacock & Fig! Want to see more? 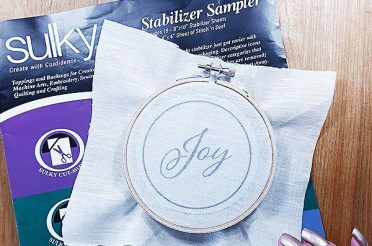 Check out the cross stitch and hand embroidery patterns in the shop, full stitching classes, basic cross stitch and embroidery tutorials on the blog, or sign up to access the free stitching patterns! Or learn more about the designer Dana and see where Peacock & Fig has been featured in the media. Tshirts, mugs, and totes now available!